We play host to a lot of incredibly complex projects here at Hackaday; take a look at some of the entries in the Hackaday Prize for some real world-class engineering. But the hacks you can knock out in an afternoon are often just as compelling as the flagship projects. After all, not everyone is looking to devote years of their lives into building some complex machine. Case in point, this very slick lamp built by [mytzusky]. Made of nothing more exotic than an old Pringles can and an RGB LED strip, this is something that can potentially be built with what you have laying around right now. All you need to provide is a bit of geometry, a steady hand, and a love for anything that looks like it could pass as a prop in a TRON fan film. The first step is getting the Pringles can: either find one in the trash or treat yourself to a stack of weird hard potato chip sorta things. Once you’ve got the can, you need to cut out your design. You could print out the template provided by [mytzusky] if you want, but you could put your own spin on it instead. Just remember that the design needs to make sense when you wrap it around the can. With the lines cut out of the can, the whole thing gets wrapped with a few sheets of standard white paper. This will not only cover the original label but diffuse the light coming from the cuts you’ve just made. [Mytzusky] doesn’t mention it, but some kind of sealer applied to the paper might be a good idea if you’re looking to keep this thing around for the long haul. Finally, an RGB LED strip goes inside the can. Make sure to flip the can upside down for this part, with the solid end on the top and the clear lid on the bottom. Not only does this let you run the wire out of the bottom, but provides a very cool ring of diffuse light at the bottom of the lamp. This is another excellent example of an “upcycled” project which uses literal trash as a building material. It might take a little outside the box thinking, but the results can be very impressive. You know the saying: “Dogs have people, cats have servants.” This is especially true when your feline overlord loses track of time and insists on being fed at oh-dark-thirty. You’re tempted to stay in bed feigning death, but that’s a tall order with the cat sitting on your chest and staring into your soul. An automatic cat feeder would be nice at moments like these, but off-the-shelf units are pricey. [Mom Will Be Proud] decided to roll his own cat feeder, and the results are pretty impressive for what amounts to a trash can build. Two old food cans form the body — a Pringles can on top to hold the food and a nut can below for the servo. The metal ends of the cans nest together nicely, and with a large section removed from each, an aperture opens every time the hopper rotates, dropping food down a chute. A BeagleBone Black controls the servo, but anything with PWM outputs should do the trick. We’d lean toward the ESP8266 ecosystem for WiFi support for remotely controlling feedings, and we’d probably beef up the structure with PVC tube to prevent unauthorized access. But it’s a simple concept, and simple is a good place to start. You shall not want for pet feeder builds around these parts. Take your pick — snazzy Steampunk, super cheap, or with an Archimedean twist. Comedian Mitch Hedberg had a theory about Pringles potato chips. His theory is the company formed to make tennis balls. But instead of a truckload of rubber, someone accidentally sent them potatoes, so they made the best of it. Certainly the Pringles can is an iconic brand all by itself. The cans also have a lot of hacker history, since they are commonly used for WiFi cantennas (even though it might not be the best choice of cans). People also use them to build pinhole cameras, macro lenses, and a variety of cannon-like devices. [Ian H] uses the short Pringles cans to build a drum kit. 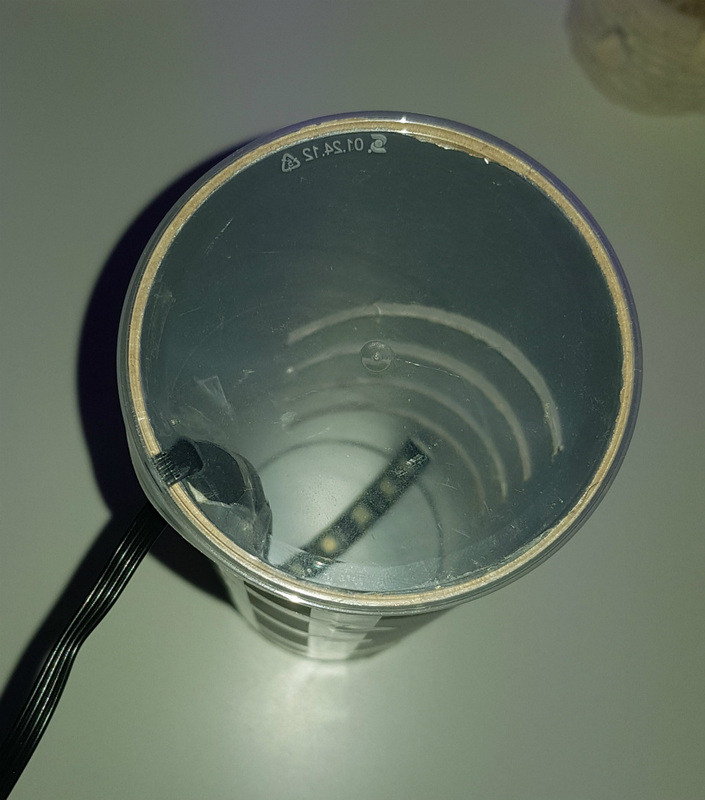 Clearly, the little cans aren’t going to make very much sound on their own, but with a piezo speaker element used in reverse, the cans become touch sensors that feed an Arduino and drive a MIDI device. You can see a video of the result, below. Reader [Harald] sent us this sweet Pringles can macro photography hack from way back in 2005. Using a Pringles can and a standard Cannon 50mm MKII lens, they have produced some amazing results. The image above is the tip of a ballpoint pen. Not only does he go through the steps to make it, but then goes in depth on how to best set your camera and other good practices for macro photography. Pringles cans aren’t just for holding chips and making wireless antenna. We’ve covered several macro photography rigs before, like how to do macro photography with your iPhone, or with a flip camera, and even how to build a massive laser controlled macro photography setup.